A Review of Ian Rogers’ SuperNOIRtural Tales (Burning Effigy Press, 2012). I was so excited to see that Ian Rogers had collected a number of his Felix Renn Black Lands novellas into one volume and published it as SuperNOIRtural Tales. 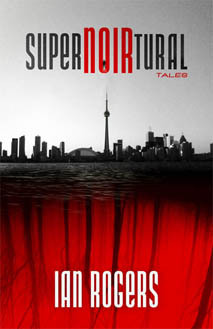 I had reviewed his novellas Temporary Monsters (https://speculatingcanada.wordpress.com/2012/08/13/performing-the-monster/), The Ash Angels (https://speculatingcanada.wordpress.com/2012/08/28/spectres-spooks-and-supernatural-s-a-d/ ), and Black-Eyed Kids (https://speculatingcanada.wordpress.com/2012/09/26/when-death-is-better-than-continuing-fear/) and was happy to see that they were brought together with extensive new materials on the Black Lands and a new story titled The Brick into this fantastic volume that blends the supernatural with a detective noir novel. Ian Rogers twists and warps the natural world in his Black Lands stories, taking normal experience, normal reactions, and normal people and placing them into contexts where they are forced to face trickles of the weird drifting in from otherworldly portals from the monstrous Black Lands. This is a world where children, for generations told that the monsters that they imagined under their beds are now real and are taught how to cope with the monstrous in their school. A world with governments like ours who are coping with a populace afraid of invisible, sudden, and unexpected threats and are coping (much like ours) by keeping details secret and doing horrible things in their belief that they are preserving the public interest. Where in our world, government secrets, the policing of people, and militarism are focussed on issues like ideas of global threats like nuclear militarisation, the spread of viruses, environmental degradation, and ideas of border security, the borders of Ian Rogers’ world are that of the Black Lands, a realm of the monstrous where everything is potentially a predator, where secret agencies cover up public dangers, where disappearances could be related to the supernatural or to those who might be considered a public threat, where military groups are sent into the ‘enemy territory’ of the Black Lands, and where the Black Land portals can be considered a spreading taint that can appear without warning. Like in our world where the permanent, nascent fear of catastrophe has permeated aspects of social and political life, the Black Lands is highly politicised and represents the anxious currents of the world surrounding unknowable threats. But, like in our world, the nascent anxiety of potential danger becomes a background noise, fearful whisperings in the dark, and people in the world of the Black Lands novels learn to ignore the reality of the monstrous threat that stands a thin reality line away in order to cope and live normal lives. They know that the world as they know it can change at a moment’s notice, that constant interruptions to the world that they view as normal are possible, likely, and increasing, but they cope with the low-level anxiety in order to maintain their thin conceptions of a normal world. Rogers plays with the juxtaposition of the ordinary and the extraordinary, illustrating how ordinary people can learn to cope with the introduction of the Weird into their everyday lives. In the newest Black Lands story in this volume, The Brick, Ian Rogers focusses the idea of disruptions interrupting the norm on a place that most of us most associate with safety, security, and normal existence: The Home. Felix Renn is brought into a case involving a girl who disappears suddenly from her home, and, in his search to find her, encounters a real estate agent friend who specialises in buying and selling haunted houses. The house becomes an unsafe space, its insecurity and lack of safety exposed: Ian Rogers ‘Weirds’ the home, disrupting the safe blanket of domesticity that has become the foundation for Western modernity. Houses become things that can attack people, that can kill, that can be possessed… and even the bricks of the home itself can become infused with the ‘Weird’. They can be tainted spaces, infused with the miasma of the Black Lands. This entry was posted in Fiction Book Reviews and tagged anxiety, body, conspiracy, detective, fear, government secrets, haunting, Ian Rogers, Monstrosity, noir, reviews, secrecy, supernatural, tainted.